The EU now possesses a clear legal basis for taking action on criminal law matters and steering the policy and practice of Member States in relation to crime and criminal law. However, for what is now an important area of law, there remains a striking absence or uncertainty regarding its theoretical basis, its legitimacy and its conceptual vocabulary. This book offers a review of the significance of EU criminal law and crime policy as a rapidly emerging phenomenon in European law and governance. Bringing together an international set of contributors, the book questions the nature, role and objectives of such 'criminal law', its relationship with other areas of EU policy and law, and the established rules of criminal law and criminal justice at the Member State level. Taking up such subjects as the application of criminal law across national boundaries and in the broader European context, effective enforcement, and the working out of a new European policy, the book helps to structure an increasingly significant subject in law which is still finding its direction. 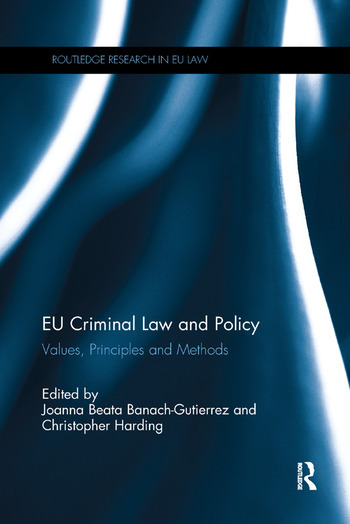 The book will be of great use and interest to researchers and students of EU law, criminal justice, and criminology. Joanna Beata Banach-Gutierrez is Associate Professor at the Faculty of Law and Administration, University of Warmia and Mazury in Olsztyn. Her research interests are focused especially on international criminal law and procedure, European criminal justice, comparative criminology and crime policy. Christopher Harding is Professor at the Department of Law and Criminology at Aberystwyth University. His research spans European and international law, criminal jurisprudence, penal theory, the history of crime and the penal system, and the protection of human rights.